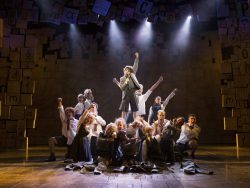 MATILDA the Musical, is now on stage at Plymouth Theatre Royal, until Saturday 16th Febru­ary. Inspired by Roald Dahl’s beloved book, the show was commissioned by the Royal Shakespeare Company and opened at the company’s Stratford-upon-Avon home in November 2010. Written by Dennis Kelly, with music and lyrics by Tim Minchin, and direction by Matthew Warchus, the show has now been seen by eight million people around the world, after touring to more than 65 cities and playing more than 6000 performances in the West End, on Broadway and on tour across North America, the UK, Ireland, Australia and New Zealand. At Plymouth, Miss Trunchbull is played by Elliot Harper, who is joined by Carly Thoms as Miss Honey and Seb­as­tien Torkia and Rebecca Thornhill as Mr and Mrs Wormwood. The title role of Matilda is shared by Annalise Bradbury, Lara Cohen, Poppy Jones and Nicola Turner. For more details of the Plymouth dates, visit the website, www.theatreroyal.com or telephone 01752 267222. The tour also stops at Bristol Hippodrome from 7th May to 8th June, and at Southampton May­flower from 11th June to 6th July.